OLCD also has something in common with a-Si LCD which is equally important to highlight. OLCD and a-Si LCD are the display technologies that are easy to scale both in terms of physical size and manufacturing rate. This is crucial when comparing OLCD to other emerging flexible display technologies, because it is this attribute that makes OLCD the most cost-effective flexible display solution, especially for larger format display applications. First, let’s consider the display size. The first LCD modules were used in very small calculators in 1971 but they have been getting bigger ever since. Today a-Si LCD technology is used to make displays larger than 100” diagonal and is unquestionably the best technology for large area. The key components that make up an a-Si LCD are the backlight unit (which provides the light), the thin-film transistor (TFT) array (which provides the correct voltage to each pixel), the liquid crystal (which attenuates the light relative to the drive voltage), and the colour filter array (which converts white light into a colour image). The manufacturing processes for all of these components are highly scalable so the display size is only limited by the ability to keep the integrity of the voltage signal across a panel. In contrast, the panel size for display technologies relying on crystalline silicon TFT arrays are limited by the uniformity of the crystallisation process (which means these displays are mostly used for smartphones). Any display relying on the most efficient direct emission OLED technology is limited by the OLED materials deposition processes. Another restriction for OLED is more stringent driving requirements for the TFT array which makes keeping the signal integrity across a larger panel more difficult. Luckily OLCD can take advantage of the existing supply chain for a-Si LCD for most of the module components with the only change being that a new TFT array technology is required. Organic TFT (OTFT) utilises a uniform semiconductor layer so there are no size limitations induced by crystallisation effects, meaning OLCD possesses the same ability to scale in display size as a-Si LCD. FlexEnable has already proven this potential by quickly transitioning from 4.7” to 12.1” demonstrator displays in less than 12 months. Scale also refers to the rate at which displays can be manufactured and it is the OLCD’s similarities to a-Si LCD which separates it from the other flexible display technologies. In fact OLCD can actually be manufactured in existing a-Si LCD factories benefitting from the infrastructure already in place to make large displays. When an a-Si LCD line is re-purposed to make OLCD panels, the factory layout is maintained and small modifications are only required within section used to build the TFT array. Even within this section, making OTFT is broadly speaking very similar to a-Si TFT. For both technologies there are a similar number of transitions between deposition to patterning process clusters. The most significant change is that chemical vapor deposition steps are skipped and replaced with highly scalable solution deposition steps which are just as fast and cheaper to operate. Just like a-Si LCD, for OLCD the OTFT array and colour filter array are made separately and assembled together with the liquid crystal. The backlights are added separately to complete the module. 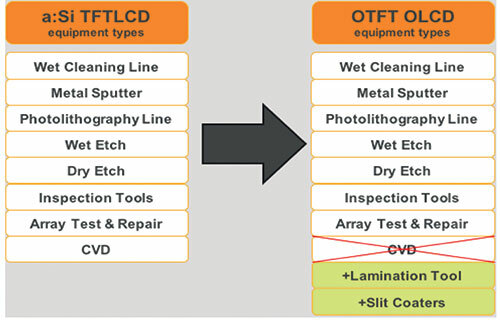 One of the biggest benefits of OLCD to manufacturers is that no special equipment is needed to de-mount the plastic from the glass (unlike other flexible display technologies); the low stress heat-based de-mount process is an exceptionally elegant step which protects the integrity of cell gap when the glass carrier is removed. Other flexible display manufacturing approaches use more exotic laser-based techniques to remove the display from the glass after the process is complete. This adds complexity, reduces throughput, and reduces yield which ultimately limits the cost effectiveness of these technologies. Manufacturing at scale is paramount to all the process development that FlexEnable does at our prototyping facility. It is that vision that instructs all our efforts to provide prototypes to existing customers and transfer the technology to target factories. Chuck Milligan, CEO of Flexenable, will speak at the Automotive Display Conference on 23 May at 15:00. Chuck will describe Flexenable's conformable organic LCD (OLCD) technology and its applications in automotive interiors. Additionally, FlexEnable's Display Systems Manager, James Harding, will give a presentation on 'Flexible LCDs enabled by OTFT' on 25 May at 10:40-12:00 in room 502B.